The Holy Ground of Joseph’s House was created, nurtured and birthed through the power of prayer. The prayers of all of those pro-life warriors who have sacrificed and fasted for the right to life for all unborn children since Roe v. Wade became the law of our land in 1973. 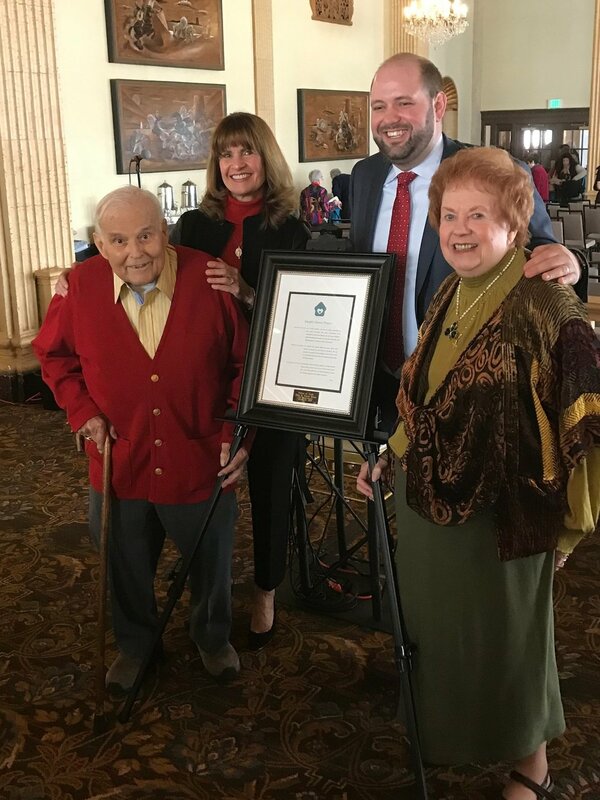 On Tuesday March 19th, 2019, Joseph’s House celebrated five years of life, five years of love, and the birth of 51 newborn babies and honored two of these pro-life heroes and prayer warriors, Teresa and John Brusa. Thanks to all of you able to attend and or support our mass and breakfast at this most special celebration. It was a stellar event beginning with a prelude of music from Ms. Althea Chaplin from True Vine Church, a most inspiring mass and homily from Rev. Matthew Lyons of Holy Family Church and the music of one of our founders and past Board President, Barry Vaughn. Many friends from our past and many new faces as well, joined us as we celebrated the most remarkable achievement of saving more than 50 newborn children, their mothers, and their siblings, from homelessness, hunger and abandonment. More than 50 new born babies whose lives were saved and preserved because of the blessing of Joseph’s House. Tuesday morning, before our event, I went to pp to say a Rosary as I have every St. Joseph’s Day since 2009. It was eerily quiet and still dark so I stayed in the car. I thought about all the people who work in that building and how when I was there praying more regularly the employees recognized me. My “Good Mornings and God Bless yous” to them for 4 years were never acknowledged until they heard about Joseph’s House. I prayed for them again on Tuesday, although I did not see them or anyone else there. I realized the people working there now would no longer recognize me, making me understand I need to be there more often. I also realized they not only would not recognize me, they do not recognize what they are doing. Meaning, to paraphrase the words of Jesus from the Cross, we are to pray for them. We are “to forgive them for they know not what they do.” We must always remember we may easily misjudge their motives, easily misjudge their intentions and easily misjudge their beliefs and be sure to reach out to them in love, with respect, and with the hope they will someday see the light. I’m often asked how to best describe the mission of Joseph’s House and what we believe as Catholics. I always begin with our belief in the sanctity of human life. We also believe in the dignity of all men, women and children from all walks of life. We believe we are called to assist the most vulnerable of God’s children, most especially pregnant, homeless women and their children who have been abandoned by those they love the most through our work at Joseph’s House. ﻿We believe no woman should have to choose between a roof over her head and life for her unborn child and yet everyday we hear the words, “I have nowhere to go because I want to have my baby.” How does a young woman choose between a safe place to live and bringing a new life into the world at what is probably the most difficult and the most pivotal moment of her life? At Joseph’s House we believe one abortion is a tragedy. We believe the 3,000 abortions taking place in our country each and every day is an absolute travesty and the 60 million abortions that have taken place since 1973 in this country are an abomination. And so, Joseph’s House exists to put what may seem to be an almost invisible dent in those numbers, albeit a dent that has resulted in the saving and blessings of 51 innocent children in the past 5 years. It only takes one person to change the world my friends, and in those terms, 51 seems like a much more impressive dent. ﻿Joseph’s House is the fruitful vineyard built on the Holy Ground of the precious blood of the 60 million innocents lost to abortion. Our moms have referred to Joseph’s House as a safe-haven, an oasis of peace, a hidden gem where one learns the love of family and the love of God, many times, for the first time in their life. We are a family sharing and supporting all moms courageous enough to work hard towards leaving behind the victim hood of their pasts to become survivors for their futures. Joseph’s House was established through the abundance of God’s Mercy for His prodigal daughters and sons. It is Holy Ground Consecrated to the Sacred Heart of Jesus through the Immaculate Heart of Mary under the patronage of St. Joseph. Our most frequent prayer is we will forever be gallant foot soldiers and unfailing warriors for God striving to do His most challenging and joyful work of saving and changing the lives of His most precious children, two generations at a time.